Source is exactly "Charles Abed"
Charlie Abed's passport dating from his childhood, during which he was sent from his birthplace in Kano, Nigeria, to attend boarding school in Lebanon. 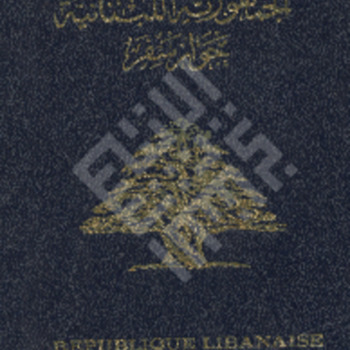 A Lebanese identification card belonging to Charlie Abed. An identification photograph of Charlie Abed from his passport. A portrait of Charlie Abed, age 44, with his four siblings. A portrait of Charlie Abed, age six, with his four siblings. A picture from the wedding of Susan Walsh (second from right) and Charlie Abed (second from left) with unidentified relatives. A group of unidentified teenagers in Lebanon. Note from Charles Abed: "1967, in the playground with: Hany Abed, Jon Ferzian, Br. John and Joseph Tannous"
Charlie Abed's passport dating from the 1980s, covering his immigration to the United States. One of Charlie Abed's passport photographs. A picture of Charlie Abed in front of Harmony Hall. A picture of an unidentified boy standing next to a large tree and bell. A picture of unidentified relatives of Charlie Abed, including a group of five young boys. A picture of Charlie Abed, approximately five-years-old, with unidentified family members. A picture of unidentified relatives of Charlie Abed.